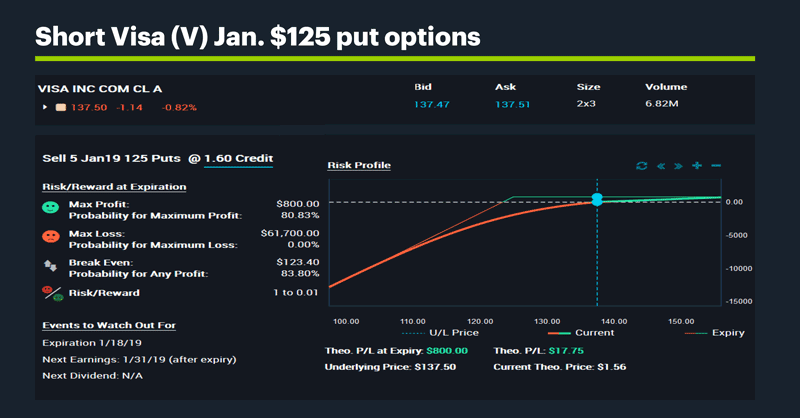 It appeared for just a moment yesterday morning, but the presence of Visa (V) on a LiveAction scan of large implied volatility (IV) increases made it worthwhile to take a look at what the stock and its options were up to. Like a lot of financial stocks, Visa (V) took an extra clobbering on Tuesday, falling 4.4% vs. the S&P 500’s (SPX) -3.2%. And amid news yesterday that threatened the fragile US-China trade-war ceasefire—the arrest of China-based Huawei Technologies’ CFO on charges of violating Iran sanctions1—Visa tumbled with the rest of the market, dropping another 3.7% in the first five minutes of trading. The combination of inflated IV (which is the market expectation of future price volatility embedded in an options price) and a sharp price drop pumped up Visa put options prices (which give owners the right to buy shares at a given stock price). 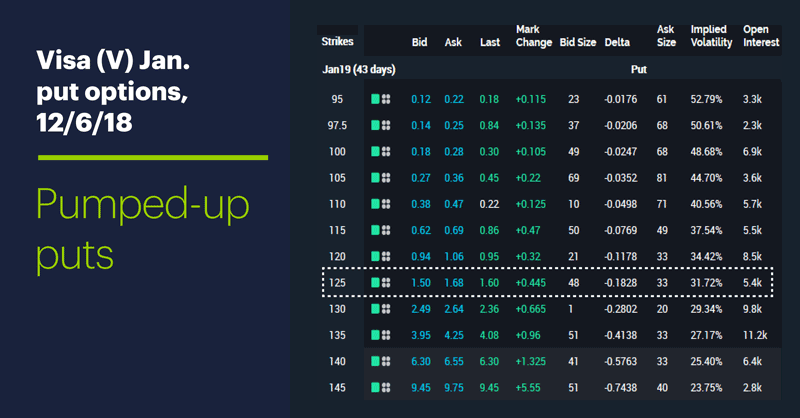 Even after the stock recouped more than half of its intraday drop, these options were still up significantly on the day, as shown in the above options chain for January puts. ●V shares were down around 6% from two days earlier, pressured by what appeared to be market-wide (not stock-specific) news. ●The stock reversed and rallied well off its early lows. In a nutshell, the first two points meant traders were looking at potentially high-priced put options, while the third point suggested at least some bulls were coming back into the stock. 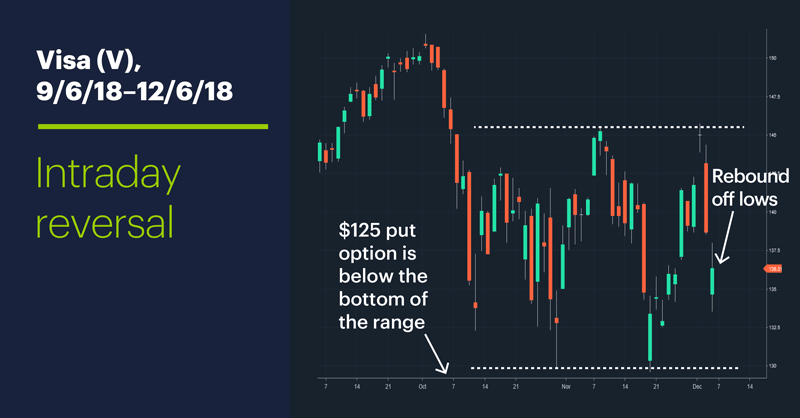 In such situations, some traders may buy the stock in anticipation of upside follow-through, while others may consider shorting puts (such as the $125 January puts) because the options may be relatively overpriced. If the stock does move higher—and options IV declines, as it often does in the aftermath of “surprise” news—the options will lose value (in addition to the time decay that affects all options over time), in which case traders can buy them back at a lower price, or let them expire worthless. The chart above shows the risk-reward profile for selling five January $125 puts at 1.60. The position would be profitable at expiration as long as the stock remains at or above the strike price. Other traders may choose puts that are even further out of the money to reduce risk (or do the opposite if they are more aggressive), but such positions will have a lower profit potential because the lower the strike price, the cheaper the put value. Say what you will about market volatility, it creates options for traders. Market Mover Update: Archer Daniels Midland (ADM) punched below its late-November swing low on news of the arrest of Huawei Technologies arrest, which dealt a nasty shin-kick to positive sentiment about the US-China trade-war ceasefire. The stock dropped more than 2.5% intraday, but rallied to close near the tops of its range and above the November 23 close. Today’s numbers (all times ET): Jobs (8:30 a.m.), Consumer Sentiment (10 a.m.), Wholesale Trade (10 a.m.), Consumer Credit (3 p.m.). Today’s earnings include: Big Lots (BIG), Vail Resorts (MTN). 1 Bloomberg.com. ‘Shocking’ Huawei Arrest Threatens to Upend Trump-Xi Trade Truce. 12/5/18.